Replaced by the 1017_1B - PhidgetInterfaceKit 0/0/8. It is the exact same device, but you can now choose which length of usb cable (if any) you want to include in your order. 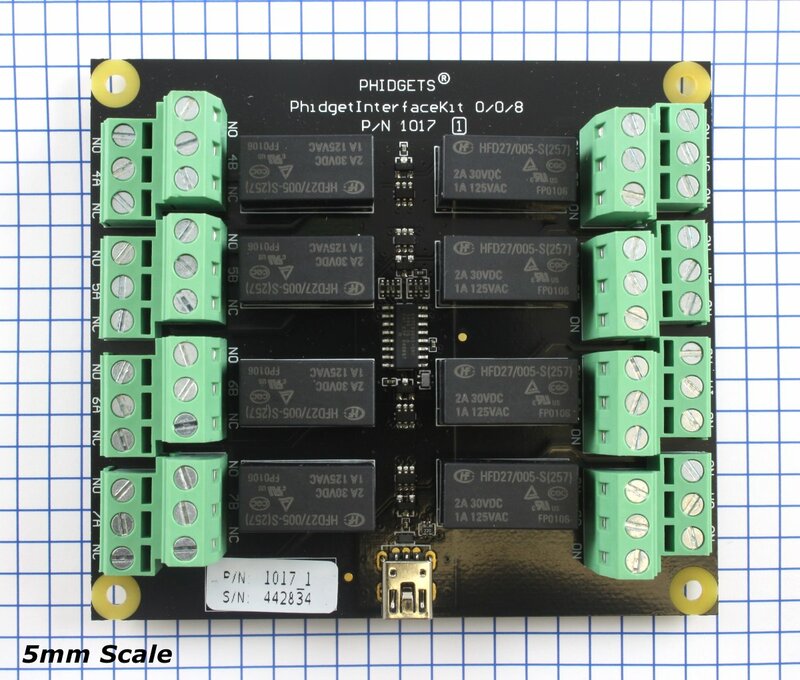 The PhidgetInterfaceKit 0/0/8 provides small signal relays with 8 relay outputs, rated at a combination of 250VAC, or 2 Amps, up to a maximum of 60 Watts. While typical mechanical relay boards are unable to switch signals due to an oxide buildup on the contacts, the 1017 excels at switching both signals and low-power applications. Please Note: These relays cannot be switched at maximum current and maximum voltage at the same time. Ensure that the total power of the load does not exceed the switching power of the relay. For example, you can switch these relays at 200V DC and 0.3 A (60W), or 30V DC and 2A (60W), but not 200V DC and 2A (400W). * This specification applies to the version of 1017_1 with black relays on it. If your 1017_1 has orange relays, the DC switching voltage is 200VDC. February 2011 1 100 Different board size. Replaced USB connector with Mini-USB connector. Larger terminal blocks. Connect the power supply and load in series. Connect the ends of the series to the NO (normally open) and the middle pin of one of the terminals. Now that you have everything together, let's start using the 1017! 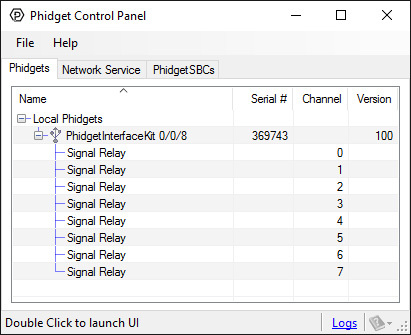 In order to demonstrate the functionality of the 1017, the Phidget Control Panel running on a Windows machine will be used. Linux users can follow the getting started with Linux guide and continue reading here for more information about the 1017. In switch schemes, the number of poles represents the number of common terminals a switch has, and the number of throws represents the number of switchable terminals that exist for each pole. 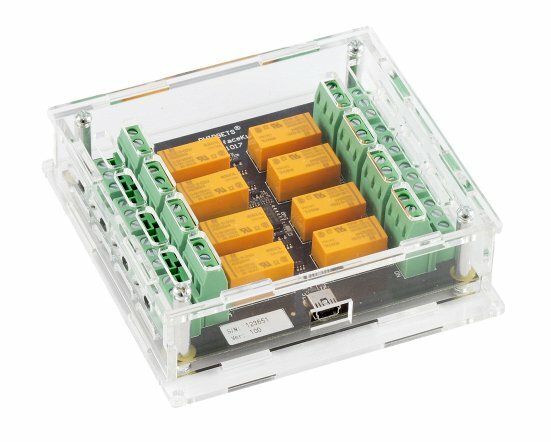 The relays used in the InterfaceKit 0/0/8 are DPDT relays: double pole, double throw. The internal construction of this type of relay is depicted in the diagram above. Many other types of relays exist: SPST, DPDT, and DPST, to name a few. 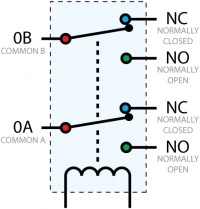 In a relay, one of the throw terminals is labelled normally closed (NC), and the other is labelled normally open (NO). As the name indicates, the normally closed terminal is the terminal connected to common when the relay coil is not powered. When the relay coil is energized by the relay control circuit, the electromagnetic field of the coil forces the switch element inside the relay to break its contact with the normally closed terminal and make contact with the normally open terminal. The switch element would then connect the normally open terminal and the common terminal. These relays cannot be switched at maximum current and maximum voltage at the same time. 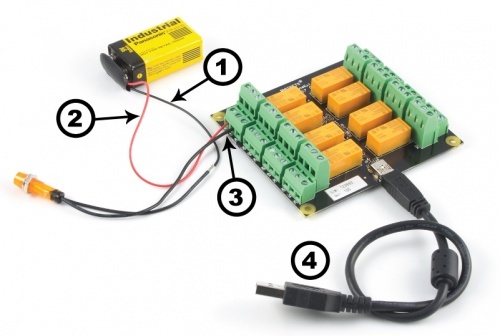 Ensure that the total power of the load does not exceed the switching power of the relay. For example, you can switch these relays at 200V DC and 0.3 A (60W), or 30VDC and 2A (60W), but not 200VDC and 2A (400W). When a relay is in one switch position for a period of time, oxidation of the open contact(s) can occur. Depending upon the internal coating material of the contacts, oxide films of varying density will be displaced upon the surface of open contacts; this film acts as an insulator to current flow. When the relay is switched, a certain amount of current flowing through the contacts, known as the wetting current, is required to remove the film of oxides and ensure proper conduction. The wetting current required to operate this relay is low enough for use in signal switching applications. Check the specification table for your relay board to find out the Minimum Load Current or Wetting Current. 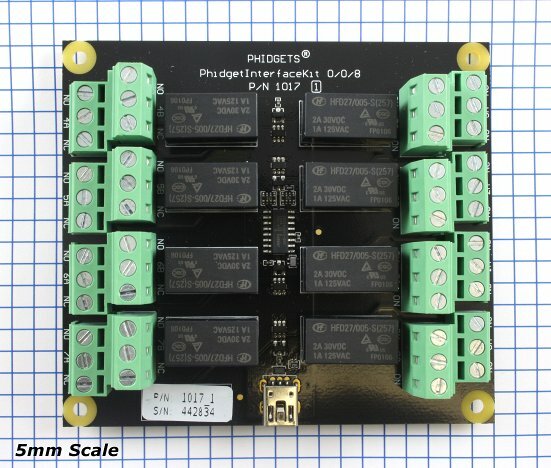 If highly inductive loads are used with this InterfaceKit, it is recommended that a noise limiting component be used to prevent damage to the device. An MOV, TVS diode, or kickback diode (for DC applications) shunted across the load will assist in dissipating voltage transients.